#3305-06 are now fully rehabbed. This is the first one done that had LED color signs already installed. I thought maybe those would be last, I guess not. #3267-68 has yet to return to service while it's been sitting in the same spot at the Kimball Yard for almost a month now. Is #3289-90 fully rehabbed??? I don't think #3267-68 has ever went in service. If it did maybe one time. #3367-68 was out yesterday for it's first trip. #3271-72 went out a few days but it's stuck on the fence just inside the lawrence side all week. #3289-90 is rehabbed on my list page one of this thread. I should be up to date but I think I'm missing two cars because usually they send over eight cars and this weeks new ones are #3305-06, #3291-92 and #3367-68. Yes, I saw #3271-72 by the fence also. #3289-90 is sitting in front of the shop entrance. 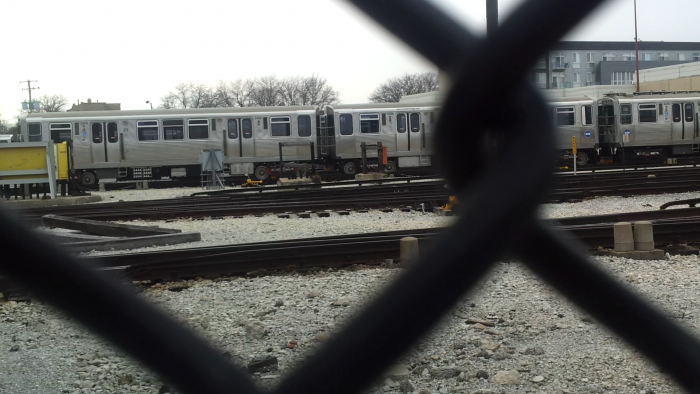 They seem to be going after the Orange line cars in the #3300's. First #3311-12, then #3375-76, #3363-64, #3367-68 get rehabbed all from the orange line. Then they keep going down the #3300's from #3314 now all the way down to #3305 and the #3290's are creeping in. I bet they go after #3369-70 and #3373-74 next and the few other #3300 sets they have. Maybe they intend to let them have the #3290's to #3314 eventually once they work out all the kinks. I guess it's too much trouble to send a car all the way south and it has problems. Here's shots of #3305-06 Damn next time i might have to bring a zoom lens!! #3339-40 is now fully rehabbed. This is the second pair now that was rehabbed that had LED signs already. NIce pics. Not being facetious when I say this: like the effect of the chain link fence in the foreground. On channel 20.2, there was some sort of indigenous hip hop in front of a similar scene, and they confirmed it was in Chicago. The vandals hit #3423 in the door pretty good over here at Kimball yard. Since that is an unrehabbed car, I would just send that one to Skokie for rehab. Problem solved. How do they manage to get in a yard and walk over to their intended targets to tag them with all those active third rail tracks? Touch one of those and *ZAP*!!!! A while back I heard that sometimes they make it and sometimes they don't. It looks like the Orange Line just got another LED sign equipped set (3403-3404), since it was reported in the Rosters thread that that set is now at Midway Yard. 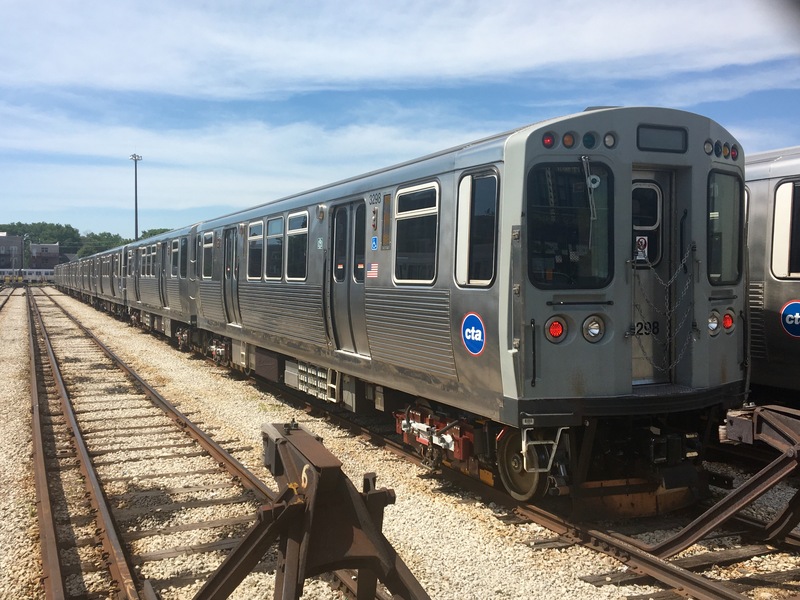 A good number of 3200s assigned to the Orange Line must be going through rehabs from looking at how the current car counts for the Orange Line show only 66 3200s assigned while the other 108 cars are 2600s. Alot of times I see more #3200's in the yard than in service in the afternoons. You'll be lucky if you see one complete set of #3200's and maybe a mixed #3200 and #2600 set in service. Probably those all go out in the morning for brownages. The #3403-04 car set I saw was on the middle track that has #2699-#2700, #2789-90 and #2799-#2800 and those cars don't really go anywhere like they are some kind of out of service/work train. It's possible #3403-04 was there for some service Midway does that Kimball shop don't do. For example didn't they say Midway, 54th and maybe Harlem shops were the only place with wheel truing machines. I haven't yet seen it in service. I saw an Orange Line train a few days ago where the first two cars had LED destination signs. The numbers were not 3207-3208 (formerly the only cars on the Orange Line with such signs). I think they were 3249-3250 but I may be mistaken. It was sunny outside so I couldn't tell if the interior lights were LED or not (the telltale sign of a full rehab). 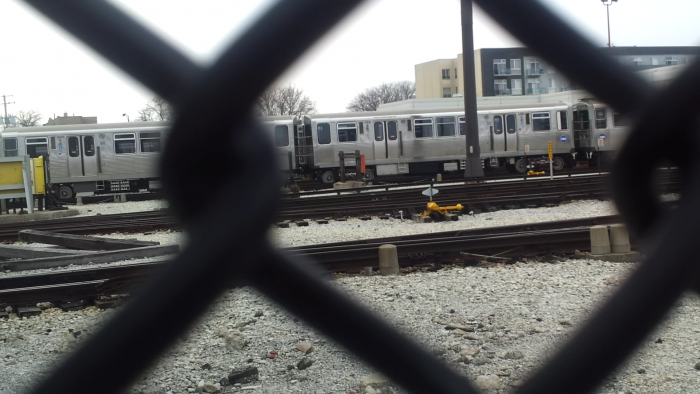 They could be getting some back to Midway that have been rehabbed, or maybe moving some from the Brown Line. If they need more cars, it'd be nice if they had some extras on other lines. OH WAIT! They have plenty of extra 5000s on the Green and Pink lines! Shame they're too biased to move those. Yeah you should see howard yard in the rush a good 50-100 cars just sit there. I past Rosemont yard the other day and the cars were so old and grimy I thought maybe they were going for a grunge look. Someone please clean up those cars at least. A vintage fleet at least looks better when it's clean. I agree completely. They just neglect all their old cars, and usually the new ones too. I've only seen clean 5000s on the Purple Line; the rest are disgusting. They just don't have their priorities in order at all. #3423-24 showed up this week on the Brown line. What CTA did was wrap it. It has a new full car wrap for some brand I didn't recognize. I guess that's one way to cover it up. They could probably have easily got the vandalism off the metal but the rubber sashes might have been a problem with some ghosting of the graffiti. It's been really slow lately on the #3200 rehabs. What did everyone go on vacation or something? So will #3457-58 get rehabbed too, what with 3258 actually being a 2600- series car? And when its time for the rest of the 2600s to go, will 3458 stay? It's been a while but I've spotted rehabbed #3357-58 at Kimball Yard.